And this year’s Excellence in Marketing Award goes to . . . The K&L Gates library newsletter, AsktheLibrary! Ellen Bowman, our intrepid newsletter editor, and frankly the lead writer too, accepted the AALL for Excellence in Marketing Award for Best Newsletter at this year’s annual meeting. AsktheLibrary, our quarterly K&L Gates library newsletter, is a great medium for communicating our value to our lawyers. Our firmwide newsletter includes news about the firm’s print and electronic resources, free and low-cost resources available on the web, links to our online training guides and other tools for navigating the information landscape. 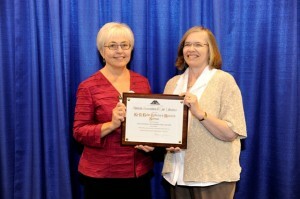 Congratulations to Ellen and the library staff at K&L Gates for winning this award.